Luggage Tage, made from heavy fabric in different branches military camo or solid colors. 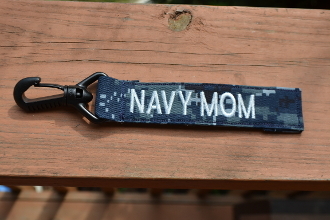 Example: Navy - Digital Blue Camouflage. Available with Silver/Gray letters or Pink letters with your name choice. Other colors are used for different branches to match the fabric. The luggage tag has clear plastic on one side so you cna add your personal info in case your luggage is lost. On the other side it has the "Name" of your choice. This Price includes FREE Shipping!